The xDR Mediation utility allows CDRs from various external sources to be imported into PortaBilling®, which bills them as if they were regular calls or messages being sent by a remote gateway. If source files already contain charged amounts (e.g. calculated by the carrier or some outsource billing agency), simply import them to PortaBilling® so that these charges will be included in customer invoices. This utility is useful for service providers who operate in mobile networks (2.5 / 3G) and for legacy equipment owners whose gateways do not support RADIUS and can therefore only save xDRs to files. · CDR Rating, which communicates with the billing engine via RADIUS. It sends CDR collection data for processing and receives notifications about the import status. 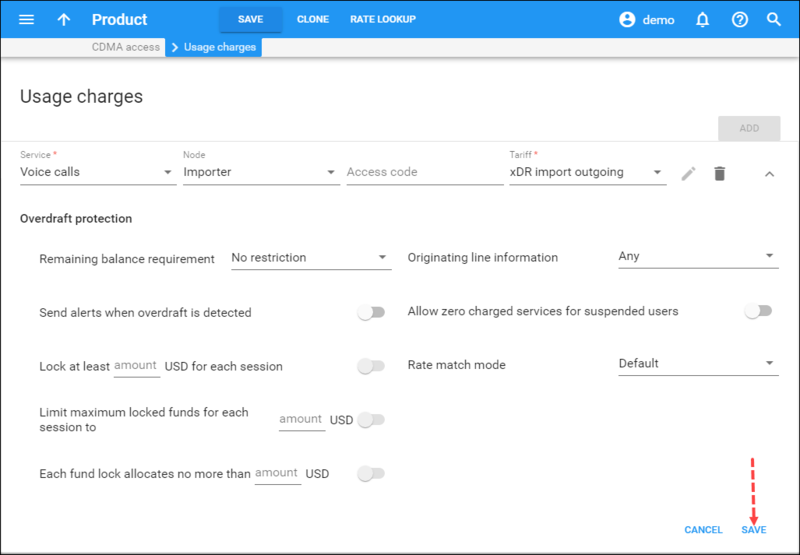 Though the xDR Mediation utility is typically used to import CDR records for such common services as voice calls, SMS and data transfer, you can also use it to import and bill customers for IPTV or other quantity-based services (e.g. pizza-delivery orders). This document provides instructions on how to configure the import of xDRs from the .csv format. For detailed description how to import xDRs in other formats, please refer to the How to… handbook. Prior to configuring the xDR Mediation utility, obtain the file that contains examples of xDRs to be imported to PortaBilling® from your carrier. Carriers can present CDRs in their own manner: storing CLI / CLD in the local format, having a different column order, providing several records applicable to the same session, etc. Therefore, CDR samples are analyzed and, if necessary, the xDR mediator module is implemented to correctly parse and transform the data for further processing. Implementing the xDR mediator module requires specialized programming and testing efforts. You can implement it on your own or request assistance from the PortaOne Support team. For assistance, please contact support@portaone.com with a request. Please note that such assistance is not included in PortaCare and will be billed separately. Let’s say you are a service provider operating on the CDMA network. You provide SIP on net calls to your customers via PortaSIP® while off net calls are terminated by your carrier TATA Telecom. TATA Telecom sends you CDRs that you need to import to PortaBilling®. To automate the CDR retrieval process, you configure the xDR mediator to automatically download the source CDR files from TATA Telecom via the FTP protocol. Note that you require the credentials to access TATA telecom system and the path to the directory from where to download CDR files. 3. From the Configuration tree, select Auxiliaries ->CDR Mediation -> CDR Extraction and click the Instance Create icon. · Service IP – Select one of the web server’s IP addresses. You may utilize a private IP address for better security (e.g. to avoid possible brute force attacks). Please note that the CDR Extraction instance cannot have the same IP address as the RADIUS instance. · type – Select the CDR source file type. Leave .CSV here. · csv_field_separator – This is the separator to use when splitting .CSV file lines into columns. · column_list – Specify the header names for the .CSV file. Type in the following string: User-Name,Calling-Station-Id,Called-Station-Id,Acct-Session-Time,h323-connect-time,h323-disconnect-time,PortaOne-Service-Type,h323-remote-id,NAS-IP-Address. Please refer to the Mandatory Attributes for xDR Import section for the list of attributes required for a particular service. The header order is important. Make sure the names you define directly correspond to the column order in the source .CSV file. · file_pattern – Specify the file name pattern. It may contain the wildcard (e.g. abc*.csv). The xDR mediator will import only those files with names that fit this pattern. · files_input_directory – Specify the path to the folder from where the xDR mediator will extract source files (e.g. /porta_var/upload). · time_zone – Select the time zone in which the xDRs will be imported. However, if a particular time zone is specified in the source file, it will override the selected time zone. · enable – Set Yes. · files_directory – Specify the path to the directory with the source CDR files on the remote host. · host – Specify the IP address or domain name of your vendor’s host. The xDR mediator will connect to it to download CDR files. · login, password – Specify the credentials obtained from your vendor to access their host. · protocol – Select the protocol for file download: FTP or SFTP. 7. In the Global group specify how many parallel processes will convert source CDRs and send CDR collections to interim data storage. Leave the default value here for now. · cdr_export_delay – Specify the time interval to import CDRs from several source files in chronological order (e.g. 43200 seconds meaning 12 hours). This defines how long an extractor waits before adding CDRs to the collection for rating. The period starts when the first CDR is parsed. When the timer fires, the extractor aggregates the ready-to-import CDRs and adds them to the collection. Then a new period starts. The default value is 0 seconds meaning that processed CDRs from a source file are immediately added to the collection. · max_wait_incomplete_cdr – This defines how long an extractor waits before adding incomplete CDRs to the collection. The default value is 3600 seconds. This value is applied if you configure the Extractor to merge several CDRs into a single xDR. Please find details about this in the merge several CDRs into a single xDR record section of the How to handbook. · min_freq – This defines how often the ready-to-import CDRs must be added to the collection when processing a large source file. NOTE: When configured, the value from the delay period overrides this value. · name_pattern – This specifies the pattern for the collection’s name. If left empty, the system names the collection based on the date and sequential number (e.g. cdr2018-07-22 or cdr20170801_0745_1662100001621_0001). · per file – a separate collection is created for each file in the input folder. · per day – a single collection is created for files that appear in the input folder during a current day. · per import – a separate collection is created for all the files in the input folder. TIP: You may define data transformation rules that will be applied to the parsed data from the source CDR files. To do this, create your custom Perl module and define its name and the path to it in the DataTransformation group. Please refer to the Data Transformation Module for xDR Import handbook for details. 1. From the Configuration tree, select Auxiliaries ->CDR Mediation -> CDR Rating and click the Instance Create icon. · Service IP – Select one of the server’s IP addresses. Please note that the CDR Rating instance cannot have the same IP address as the RADIUS instance. 3. In the Global group define how many parallel processes will run to process the CDR collections. Leave the default value here. 2. Click and select the interim-data value for the with_indices option. This determines whom to charge for the session. Voice, Msg, Netaccess, Quantity, Iptv. This is the type of service used within a session. Default – Voice. The connecting time for a session. Session disconnect time. Either h323-disconnect-time or Acct-Session-Time must be provided. Either h323-disconnect-time or Acct-Session-Time must be provided. The IP address of the vendor gateway. The ID of the remote gateway. The timestamp for the message being sent. The timestamp for the session. Indicates the number of bytes sent to the user during a session. Indicates the number of bytes received from the user during a session. The number of units transferred. Default – 1. The type of service used within a session. Determines whom to charge for the session. If you have just installed the PortaSwitch® software or just dedicated a new billing environment to configure the services described in this handbook, make sure to first perform the initial configuration of PortaSwitch®. To do this, use the PortaSwitch® Initial Configuration handbook. Now create a node that represents the xDR mediator. · Node ID – Enter the IP address assigned to the CDR rating instance on the Configuration server web interface. · IP – This is the IP address assigned to the CDR rating instance on the Configuration server web interface. 4. On the Communication with billing panel move the Enable communication with billing slider. · Client protocol – Select RADIUS, since the server (node) must be able to communicate with PortaBilling® via RADIUS. · Radius key – Specify the authentication key used for communication with PortaBilling® via RADIUS. Specify SecretKey here. NOTE: The Radius key value can be found in the /home/porta-cdrimport/etc/cdr_importer.<xdr-import_instance_name>.conf file in the [Radius] section. The tariff is a single price list of your calling services or your termination costs. PortaBilling® requires that every call be accounted for, both on the revenue side (customers) and on the cost side (vendors). Therefore, the tariff is used to calculate your costs. Since xDRs are imported into PortaBilling® for sessions already completed and the vendor must not participate in call routing, the Routing option must be disabled for the vendor tariff. · Routing – Clear the Routing option. Rates are the per-destination prices. Please refer to the Call Billing Parameters section of the PortaBilling Administrator Guide for more information on billing parameters. · Upload the rates for geographical destinations according to the tariff sheet provided by the carrier. Vendors are your termination partners. PortaBilling® requires that every call be accounted for on both the revenue side (customers) and the cost side (vendors). In the case of calls going via the mobile carrier’s network, no vendor (in the traditional sense) is involved – so you still need to create a vendor that will be used to keep the xDRs for these calls. This vendor and the connections to the vendor are required in order to properly bill for calls. 5. Fill in the information about the vendor as described in the Basic Residential VoIP Service handbook. A connection represents the point from which calls leave or enter your network and / or are directed to or from vendors when charges are incurred. 1. While on the vendor’s panel, click Connections. · Active – Use the slider to set this connection as inactive. · In the Identify gateway by ID option select the Gateway ID and specify the ID of the vendor’s gateway or switch. Type in CDRIMPORTER. To charge your customers for making calls create the tariffs and define the rates within. Please refer to the Create Customer Tariffs and Enter Rates sections of the Basic Residential VoIP Service handbook for guidelines about tariff creation. 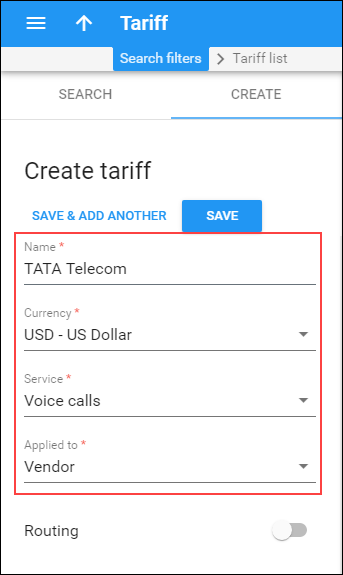 · Create a tariff to charge users for incoming calls and include it into the product rating list. End users will use accounts issued for specific products to access the services you provide. Products are powerful tools that define different ways to bill an account for one or several included services. Product definition is always realized through these steps: product definition, service definition and configuration and the creation of a rating list. · Account role – Select Mobile from the list since this product is intended to be used by mobile subscribers. The rating list has two functions: it defines the permitted access points (nodes and access numbers) and specifies which tariff must be used for billing each of these points. Now you create the rating entries to handle outgoing calls. · Node – Select the node you created for the xDR importer. · Service – Choose Voice Calls. · Tariff – Select the tariff that will be used to calculate charges for outgoing calls. Proceed with the customer configuration by performing the Enter SIM Cards into the SIM Card Inventory, Create Invoice Template, Configure Taxation, Create a Customer Class, Create a Customer and Create Accounts steps from the MVNO Service Provisioning handbook. PortaBilling® enables you to control the xDR import process and adjust the configuration if any issues occur. 1. From the Statistics section of the Admin-index, select CDR Mediation. · CDR Collection – This shows the name of the CDR collection created after parsing source file data. · Status – This is the current status of the CDR collection. · Added – This is the date and time when the collection was added to the import queue. · Total Records, Imported, Skipped, Rejected –This is the information about CDR records’ numbers and status within the collection. 3. Click the XDRs icon next to the CDR collection name to view detailed information about the CDR collection. 5. Click the Details icon to see detailed information about an individual xDR. 6. Click the BE Log icon to check log files for a particular xDR record with the BE Log Viewer.